This contest started on 3/16/19. This contest has a winner. I’ve heard great things Zingers Deli. The picture in this posting says it all! No better sandwich in South Florida. Best ny deli in Florida, hands down. Come on, pastrami! I’m waiting for you. Their pastrami and corned beef are the best in Florida. 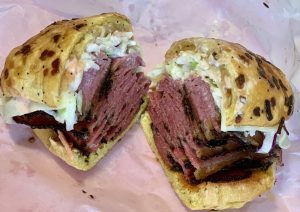 Best pastrami, brisket and corned beef in Florida.